Males, however, were not the only ones who admired Farrah’s looks — females across the United States adopted her hairstyle. The long curly locks were held in place by an abundance of gel and hairspray. That much hair, however, could prove dangerous. Farrah’s former husband, actor Lee Majors, once stated that a broken nose he had suffered, was a result of Farrah rolling over in her sleep with her hair in a ponytail, with the ponytail striking his face. 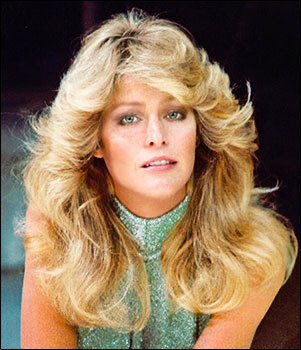 The hairstyle transitioned very well into the disco era, but when the public soured on disco, Farrah-hair quickly faded out of style.